Garlic bread is such a decadent treat, and frankly kind of a throwback at this point. I remember going to a seafood restaurant in City Island with my parents for years, and they always had a big basket of somewhat saturated garlic bread to start, dripping with oil and garlic, and it was irresistible. We all stank for days, but it was more than worth it. I sometimes make it at home, but then I decided to mess around with the idea of a sliced and seasoned loaf and some of the other condiments I had the fridge. This is a fun way to play around with and use up the various jars of half used ingredients you might have in the fridge. I had some homemade chimichurri sauce (an Argentinean garlic and herb sauce) left over from a dinner, and I always have bottled harissa sauce these days – it’s one of my new favorite hot sauces. When combined with some olive oil, they both turned into fabulous breads that would be great as a luxurious appetizer, or on the side with some soup or salad or chili or stew. In a food processor, blend together 1/2 cup washed flat-leaf parsley leaves and 2 cloves garlic, then add 1/2 cup extra-virgin olive oil, 1 teaspoon fresh oregano leaves or ½ teaspoon dried oregano, a pinch of red pepper flakes, 1 tablespoon red wine vinegar and salt and fresh ground pepper to taste. Blend well. Slice a half a loaf of Italian bread into 1/2-inch slices, but don’t cut all the way through, so they remain attached at the bottom of the loaf. 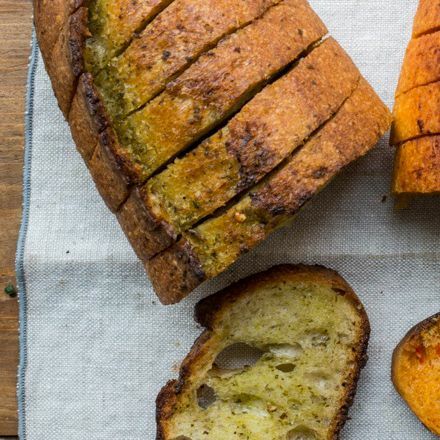 Brush both sides of each slice of bread with the chimichurri oil. Wrap the loaf in foil and place it in the oven. Bake for 10 minutes, then open the foil and continue baking the bread on the open foil for another 10 to 15 minutes until the outside is crispy. Serve hot. In a small bowl, blend together 1 tablespoon harissa sauce with 1/2 cup extra virgin olive oil. Slice a half a loaf of Italian bread into 1/2-inch slices, but don’t cut all the way through, so they remain attached at the bottom of the loaf. Brush both sides of each slice of bread with the harissa oil. Wrap the loaf in foil and place it in the oven. Bake for 10 minutes, then open the foil and continue baking the bread on the open foil for another 10 to 15 minutes until the outside is crispy. Serve hot.